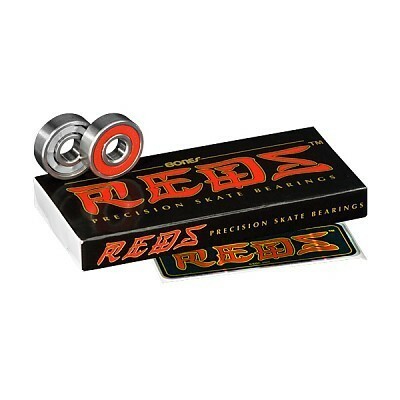 Bones REDS are the best popularly priced bearings you can buy. REDS were developed to be an affordable alternative to Bones Swiss. They feature ground and super finished chromium steel balls and races, a high speed, removable nylon ball retainer, Bones Speed Cream lubricant and a removable, non-contact, frictionless red rubber shield. This combination of Skate Rated? design, quality components and careful quality control makes them faster, smoother and longer lasting than any other skateboard bearing in their price range, so let the good times roll with Bones REDS. *All Bones Bearings are Skate Rated? to withstand the destructive forces created by high performance skating. This is our way of saying that just using a bearing with an ABEC rating is not enough to ensure that a bearing will perform well for skating, since ABEC ratings were intended for electric motor bearings, not skate bearings. We have adjusted the tolerances, clearances, lubricant, and component materials to optimize Bones Bearings for use in dirty, high impact environments... where you skate. That's why they roll faster and last longer than mere ABEC rated bearings.